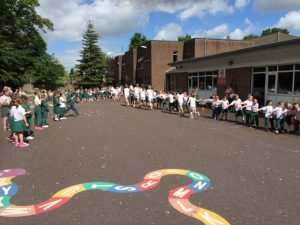 Scoil Bhríde has a strong and proud tradition of athletics. This is demonstrated in the annual City Sports event. Pupils from every school in the city and many in the county compete in the City Sports and Scoil Bhríde always puts on a great display! This year, 2017, we showed our great team spirit and a few girls even got prizes . We are very proud of the team. As is a tradition, the running team did 3 laps of honour of the school while the entire school cheered them on! 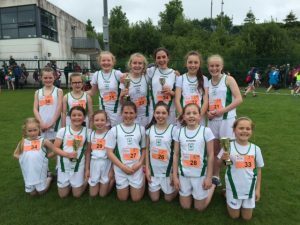 Well done to everybody involved, especially Mrs. Nalty, Mrs. Canning, Ms. Burke, Ms. O’Sullivan who gave so much time to training the girls. On the day, the team were also supported by Mrs. Landers. Ms. O’Shaughnessy and Ms. Dunne also represented the school as stewards on the day.